An idyllic scene in a lush desert wash in Catalina State Park just north of Tucson. The desert is always greenest and most enjoyable in the mid-spring months. The weather is ideal, and there are often wonderful displays of wildflowers. 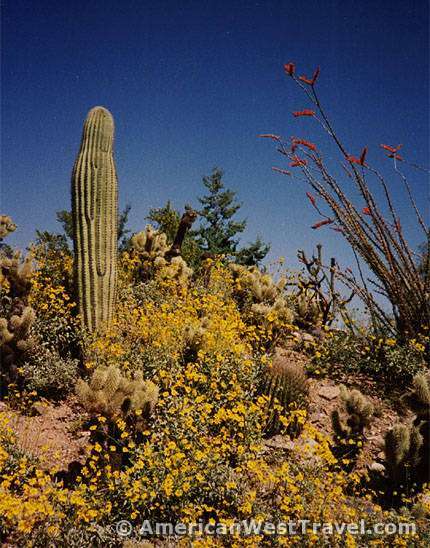 The distinguishing trait of the Arizona desert is the presence of large cacti. They occur in the Sonoran desert which occupies roughly the southwest quarter of the state particularly Tucson and southward. This is due to higher precipitation than in the other American deserts. The most well known and impressive cactus is the giant saguaro pictured left and right. 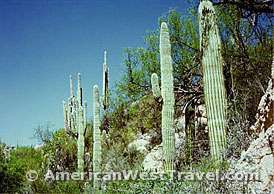 There are numerous places in the Tucson area where one can observe amazing saguaro "forests". Here you will find dense stands of giant multi-armed saguaros, the arms often taking many fanciful shapes. The conservation of these cacti has become an important issue as the urbanization of southern Arizona continues at a rapid pace. 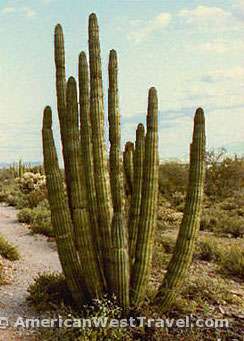 The organ pipe is another large and fascinating cactus of the Sonoran desert. It is much rarer than the saguaro, occurring primarily in the far south near the Mexican border at Organ Pipe Cactus National Monument. The monument has stands of many kinds of cacti and is extremely popular in the springtime due to frequent outstanding wildflower displays. The main difference between the saguaro and organ pipe is that saguaros grow arms high off a main stem while organ pipes grow their arms from the base. 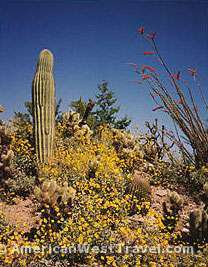 A nice combination of Arizona cacti and spring wildflowers. There is a saguaro, numerous small chollas, a barrel cactus, and an ocotillo with its beautiful red flowers. The ocotillo is not a true cactus and grows small leaves after rainy periods. Nothing is quite as pleasing as running water in the desert. 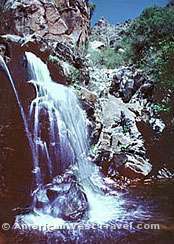 This small (and seasonal) waterfall is in Seven Falls Canyon on the outskirts of Tucson. Right, a change of pace. This colorful grave marker is in the infamous "Boot Hill" cemetary outside of old Tombstone. In case you can't read it, it says, "Here lies George Johnson, hanged by mistake, 1882, he was right, we was wrong, but we strung him up, and now he's gone." Truth or "put-on"? You decide.